While driving around a few weeks back we found this closed and collapsing old bar -- the Cobblestone Bar and Grill. The building was very interesting, but didn't really provide any good photo opportunities (at least not from the external views we had). The most interesting thing was the back door. 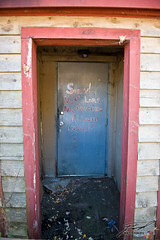 The plywood covering that rear entrance had been torn down, and from the looks of these photos the door was pried open. But what struck us was the note the incoming patrons; "Sorry, No Colors, No Patches Allowed Inside."